". 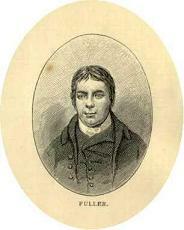 . . Fuller lacked formal education beyond the basics of reading and writing, but a passion for reading enabled him to become the leading Baptist theologian of his day." - Michael A. G. Haykin in Expositor, 2015. By A. C. Underwood, D. D.
By J. M. Cramp D. D.
written on the principles of that of Mosheim..."
Andrew Fuller's Response to the "Modern Question"